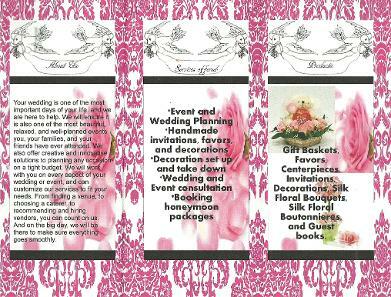 Lovey Doves will help you plan your dream wedding or event! Your wedding is one of the most important days of your life, and we are here to help. We will ensure it is also one of the most beautiful, relaxed, and well-planned events you, your families, and your friends have ever attended. We also offer creative and innovative solutions to planning any occasion on a tight budget. We will work with you on every aspect of your wedding or event, and can customize our services to fit your needs. From finding a venue, to choosing a caterer, to recommending and hiring vendors, you can count on us. And on the big day, we will be there to make sure everything goes smoothly. Planning a wedding or event can be stressful, but it doesn't have to be. We have experience planning events of all types, and will work with you to plan the wedding or event you have always dreamed about. With our help, you can focus on the things that matter, like spending time with your family and friends during these momentous occasions.